I just did the download of the new version of OpenSesame (3.2.5). I did the alterations in my project and when I tried to run the experiment, the program stopped and showed the "Oops, I did it again" message. The problem is that OpenSesame also froze and I can't scroll down or try to send the error message. What can I do to solve this? Run the experiment. This will probably crash as it does now, leaving the user interface deactivated. In the debug window, type opensesame.enable() to reactivate the user interface. 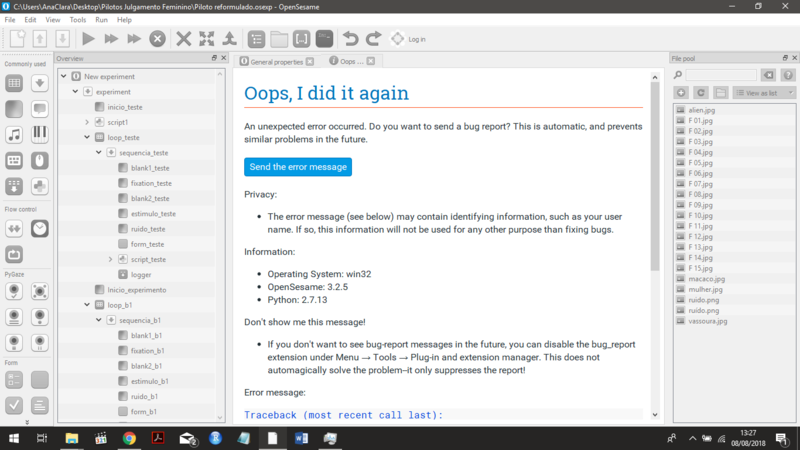 You should now be able to see the full error message and send it. Could you also post it here? I also tried with different archives but the same message appears. Ah, I see. This is a known issue caused by the External Runner. You should be able to fix this by selecting the Multiprocess Runner under Menu → Tools → Preferences.